I first started writing about 8 years ago. I’ve always thought to myself as I’m reading: “I could do this!” But when I finally set out to do it, it was not as easy as I thought it would be. Honestly the reason I wrote Thirty-Two Going on Spinster was to prove myself that I could start something and actually finish it. But now that I did it, I have the writing bug. Are you a structured writer or a see-what happens? I am a mixture of both, actually. I write out a detailed outline from start to finish before I start writing (I’m a big fan of the Snowflake Method – if you haven’t heard of it, Google it!). Once I sit down to write, though, the story takes on a life of its own and I change the outline as I go. I also do a detailed timeline. The timeline keeps me from getting my dates wrong and it also helps me to make sure there are no holes in the story. Tell us about Thirty-Two Going on Spinster? Thirty-Two Going on Spinster is about Julia. Julia’s stuck in a rut. She’s had the same mundane job for the past ten years, she’s lived in her parent’s basement for the past ten years, and she can’t even remember the last time she has been on a proper date. Enter Jared Moody, a new hire at the company she works for. Jared is handsome, funny, and seems to take an interest in Julia. Will Jared be the catapult to get Julia life’s moving? Or will she stay stuck in her spinster ways? Well, I’ll guess you’ll have to read it to find out. There was a time in my life – before I met my hubby – when I had met this guy that was quite handsome and funny and seemed to take an interest in me. I actually had a friend (I guess I should say “friend”) that tried to sabotage it all. That’s what started the story, but once I got into writing it, the story evolved and changed into something much different. Tell us about your latest novel (or what you are working on at the moment). I’m working on two novels right now, actually. The first is a sequel to Spinster. I had actually thought that the story was done and there was nowhere else to go with it. But then a sequel came to me in a dream … Just kidding, it was in the shower. So I’m working on that. I’m also writing a completely different story about a girl that tries to stop a wedding. It’s really great to have two stories going at once, because if I get writer’s block, or bored, I can switch back and forth between stories. When you published ‘Thirty-Two Going on Spinster’, did you get the response you hoped for? Not at first. I got the response I expected, really. I was a new author with no other books. I had a surge of sales at the beginning by friends and family and then it died down and it was only a handful here and there. Last June, I signed up for Bookbub and it took off from there. Bookbub is a great platform for us indie authors. I’m very thankful to them for getting me started! Would you do anything different when launching your next book? You mentioned that you’ve learned lots about marketing, could you give us a few tips? Of course! I am always willing to share with my fellow Authors. I never look at is a competition because we all have our own stories, our own styles of writing. We really should be supporting one another as much as possible, in my opinion. For advertising, there really are only three sites you should spend your time or money on. Bookbub (most important, in my opinion), Ereader News Today (ENT) and Pixel of Ink. All three are great avenues for getting your book some exposure. They are picky about who they take, and rightfully so. So make sure that you follow their guidelines! Another tip is to make sure your keywords are pertinent to your subject matter on Amazon. You can do some pretty cool things with keywords. There are books out there to teach you, invest in those. It’s worth the investment. I lucked out because my hubby happens to be an SEO (search engine optimization) expert. I knew I kept him around for something. What motivated/inspired you to become an Indie Author? 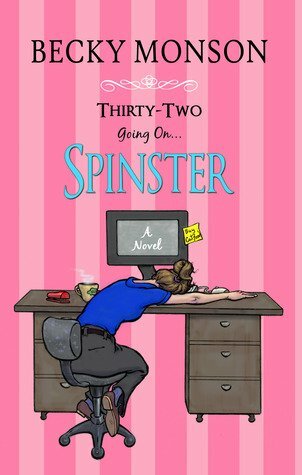 Well, I had been writing Thirty-Two Going on Spinster over a long period of time (like 8 years… holy crap that’s a long time), and I honestly thought nothing would come of it. Then I became friends with Melody Anne. If you haven’t heard of her, she is mega-successful in the indie writing world. She’s self-published and has been #3 on the New York Times Bestselling list. Once I heard how well she was doing, that motivated me to get going. I’m nowhere near her success, but I’m working at it. What advice would you give to any writer wanting to do it the ‘Indie Way’? First off all you need a book. A good one. You will want to spend your money on a good cover and a good editor. Those two things can make or break you. Yes, people still do judge a book by its cover, sadly. Then you need to market yourself. On average people need to see you and your book about 7 times before they will buy. So the more you put yourself out there (reviews, interviews, blog tours, etc.) the more you will get seen and the more successful you can be. I’m still learning everything myself. I’ve made a lot of mistakes along the way, but I’ve learned a ton. Tell us what you are reading at the moment. I just finished To Love Twice by Heather McCoubrey. I really enjoyed it. She’s an Indie Author as well. My kindle is absolutely full of books right now, I have so much catching up to do! Anything else you would like to add to your readers or to other writers? For readers – please leave reviews! That is the best thing you can do for us writers. For writers, keep on writing! One book will not make you successful, so keep at it! Find out more about Becky Monson here!